It’s about time for a new tutorial here on the blog, right?? I love learning new quilling techniques. There are many out there that I haven’t tried yet, as I haven’t had the time. For example, I have never even tried my quilling comb yet! 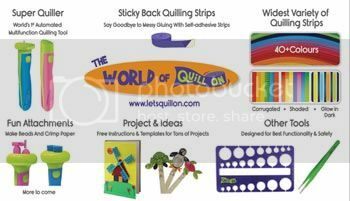 (here are some other quilling tools I have that I haven’t tried yet). But when I saw this new quilling technique called tubing, I just couldn’t wait. My mind started spinning immediately and thinking of how to use this technique in jewelry. I saw the technique first here on Jane Jenkin’s quilling blog a couple weeks ago. She explains that it is originally by Genevieve Godden and she saw it on the Quilling Guild blog (click here if you are interested in becoming a member of the Quilling Guild – you can only read the official blog if you are a member. I recently became an online member at their current discounted price). A quick google search will not find much more information about this lesser known quilling technique. About a week after seeing the blogpost about tubing, I got out my quilling supplies (for the first time since moving to our new house 5 weeks previously, whew!) and gave it a go. My first few tries were less than stellar and I quickly learned some important tips on how to make successful tubing. I’ve already made a couple different cool earring designs with the tubing. Today I’ll share the tutorial for basic tubing and how to made these awesome teardrop shaped earrings from it. It’s so much fun! 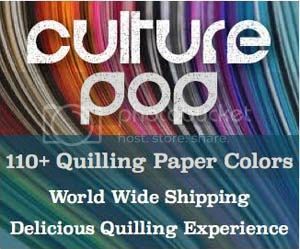 4 full strips of 1/8″ width paper (I used 2 strips of black and 2 strips of turquoise -24″ long each) – you may need more strips if you are using shorter 17″ long strips or if you are using a wider form/skewer than I am using here. long slender item for wrapping the paper (I used the 2.0mm bamboo quilling form from Little Circles) You can use a barbecue skewer, thin knitting needle, etc. 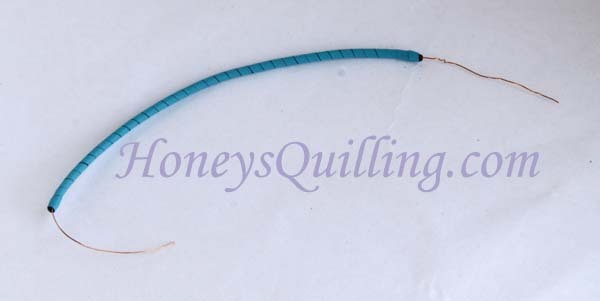 thin crafting wire , approximately 30-34 gauge, nice and thin and flexible. sealant and topcoat (optional – to make your earrings sturdy and water resistant. For these I used Ceramcoat sealer as a base, and Diamond Glaze on top). earwires and jump rings (the jump rings I used here were small ones, about 3mm in diameter). What you are basically doing with tubing is spiralling a strip of paper down a thin form/dowel/skewer with multiple layers. 3-4 layers seems to work best for flexibility plus sturdiness. 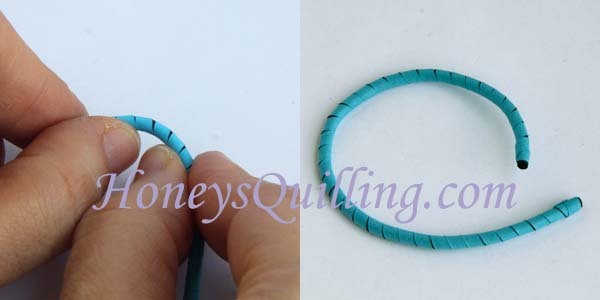 As I mentioned in the materials, I am using the bamboo quilling forms from Little Circles on Etsy. I am so glad I bought these, they are great for quilled jewelry! For this project I am using the smallest one, it says 2.0mm on the side. You can use a barbecue skewer, kabob stick, knitting needle, or anything else that is skinny like this. To start you need to glue the paper to itself. Make sure it is wrapped very tightly around the form so that it doesn’t come loose as you are working. 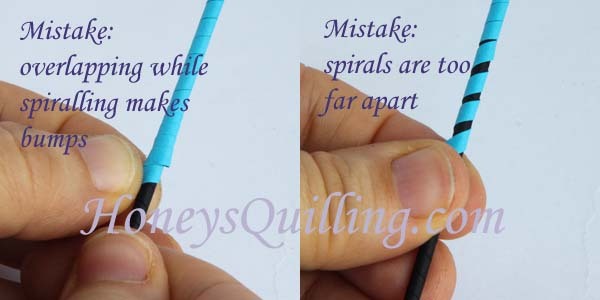 Then you’ll need to bend it at an angle because you need to start spiraling. Continue wrapping the paper around the form, keeping it nice and tight together. You don’t want to leave blank spaces, and you also do not want your paper to overlap. 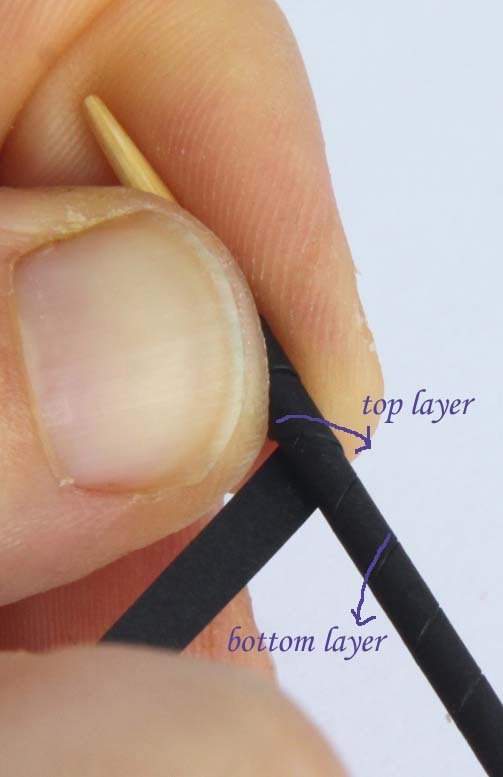 Once you have reached the other end, hold the paper tight while you put on a dab of glue. Bend the paper down to the right over the glue, and continue spiraling in the other direction. You will notice that when you turn you will be spiraling in the other direction as you can see in this photo below. The lines of your spiral go in opposite directions. This is what you want! This is what makes your tubing nice and sturdy. If you put several layers all spiraling in the same direction you would not get a strong tube. Here is a little troubleshooting. 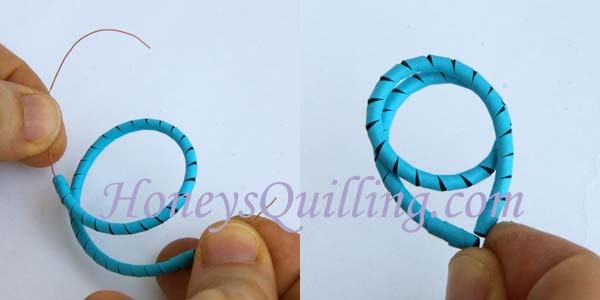 While you are wrapping your spiral, you need to make sure not to overlap your spiral and not to leave spaces. If you overlap then eventually you’ll get these bumps as you see in the left photo below. If you leave spaces it will be too loose as seen in the photo on the right below. So keep the edges of the papers right next to each other as much as possible! When you get to the end of your third layer, rip off any extra and glue the end on tightly. 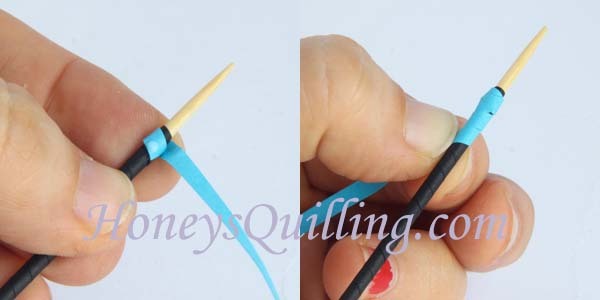 Here I also want to mention that I ONLY glue at the ends of my quilling form. I do not put any glue anywhere else along the spiral. The reason for this is because the designs I am making call for as much flexibility as possible. If you put dabs of glue along the tubing while making it, it will create stiff spots that will not bend smoothly. Not what you want here! Let your finished tubing dry for at least a few seconds and then remove it! Now this part can be tricky. Sometimes it slides off with ease. Other times it really takes some pushing and pulling to get it off. You want to be firm, but gentle. Watch carefully as you are pulling to make sure the whole tubing is coming and you are not pulling it apart. If it seems that you are pulling it apart, start pushing from the other end instead. You might have to do some fiddling, some pulling, pushing, pulling, etc. Then again, sometimes you get lucky and it comes off perfectly! It all depends on exactly how tight it was to begin with and whether you got any glue on the form or not. In the blogpost where I saw tubing in the first place she used a metal skewer that had a loop on one end. I’m thinking that must be handy for holding when trying to remove the tubing! Repeat the instructions so you have two pieces of finished tubing. Now you are ready to have some fun with them! To be able to close this design easily and make it into an earring, you need to use a wire. I used some thin flexible craft wire that I had on hand. I actually don’t know what gauge it is, it didn’t come with a label. My guess is that it’s somewhere around 34g. It is thin and very flexible. You can use any gauge you have as long as it is easily flexible by hand. Cut a piece that is longer than your tubing and stick it through. Time to shape the earrings! Be aware of the wire as it can sometimes slide while shaping. Curve your tubing as seen here until you get this fun teardrop shape. Twist the end wires together and then wrap it around some sort of tool (you can use the same tool that you used to make the tubing) to make a loop. Wrap the leftover wire around the base of your loop several times to secure it in place. Then just cut off the excess. Now repeat with the other tubing so you have two teardrop earrings. To make your pieces into earring, you need to now put on a jump ring and earwire. You can put on just one jump ring, or you can put on two or more, it is totally up to you! Now time to add some sealant! You CAN just wear your jewerly as it is now, but if it gets wet then it can easily get ruined. So I prefer to use sealant. There are many different sealants you can use. Click here to read all of the posts I have written specifically about different sealants. My favorite combination is to use a liquid sealer as a base to make the piece sturdy/stiff and then to use a topcoat or glaze to make it very water resistant. Most topcoats will be glossy, which is nice, but if you want a matte finish you can use PPA matte as your topcoat so your piece looks more like the original paper instead of shiny. The liquid sealer that I currently use is the brand Ceramcoat All Purpose Sealer . I have found it to be a great product. You can find it on Amazon or at craft shops such as Michael’s or Joanne’s. If you are in Malaysia, click here to find liquid matte sealant. For the topcoat there are SO many brands that work well. One of my current favorites is Diamond Glaze because it gives a nice hard finish. Find diamond glaze at Scrapbook.com, Blue Moon Scrapbooking, or on Amazon . To apply the sealant I pour a small amount into a cap and use a small, kind of stiff, paintbrush to paint it all over the surface. I use the jump ring and earwire to hold onto the piece while I paint. When you are finished, make sure you rinse your brush well or else it will dry completely stiff! Then hang to dry! Let it dry completely, at least a few hours but preferably overnight, and then apply the Diamond Glaze or other topcoat in the same way as the sealant. Again hang to dry. I hope you enjoy the tutorial and find it helpful! Feel free to leave any comments or questions, and stick around to view some more great pages here! I loved this new technique. Awesome Honey.I loved your new idea and technique.Surely will try. Svara told me to try a pretzel shape next! Hm….